This launcher allows you to run frequently used system commands directly from the tray. 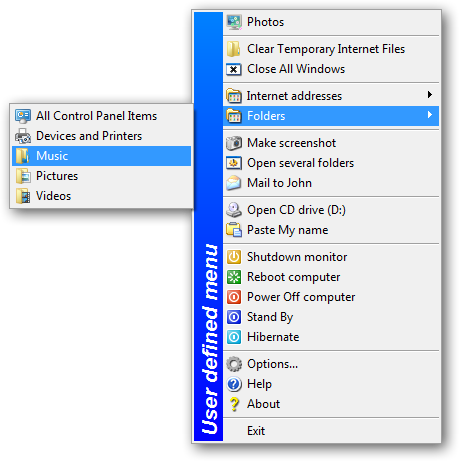 Tray Commander adds a single icon to the system tray which, when clicked, displays a menu to which you can add commands. Tray Commander can open and close your CD drives, reboot, shutdown your system, run your favorite applications, launch screen savers and set your video mode. ...... Also you can run several commands with just one click. Multifunctional utility for quick and easy control of computer from tray. Qweas is providing links to Tray Commander 2.4 as a courtesy, and makes no representations regarding Tray Commander or any other applications or any information related thereto. Any questions, complaints or claims regarding this application Tray Commander 2.4 must be directed to the appropriate software vendor. You may click the publisher link of Tray Commander on the top of this page to get more details about the vendor.